With the tactical depth of a MOBA and the fun, diverse characters of Overwatch, Gigantic is a strategic free-to-play hero shooter that’s well worth your time. 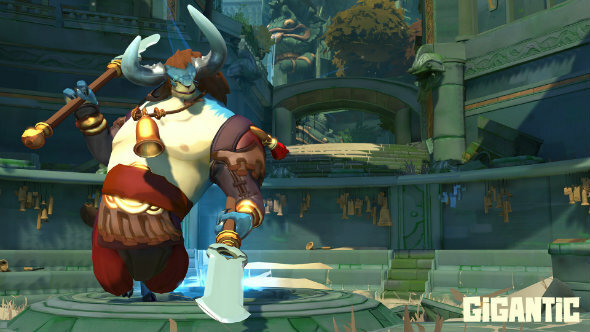 It might not have the mind-boggling 100+ characters of Dota 2, but you’re still going to want a head start on the 20 you can choose from in Gigantic. That’s where we come in. Looking for more sweet PC gaming action for precisely zero pounds? Check out our list of the best free games on PC. You’ll have access to all 20 heroes in Gigantic if you’ve stumped up enough change. If not, you’ll have to make do with the limited number of free heroes that change on a weekly rotation. 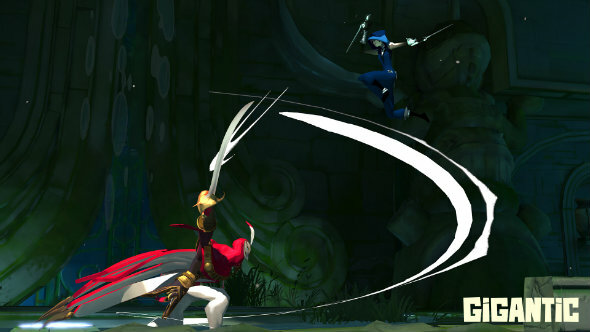 To encourage match variation, your allocation of free characters will be different to everybody else – developers Motiga claim your free characters should be plenty varied in their playstyles. You can permanently unlock characters, creatures, and skins with Crowns and Rubies, which are Gigantic’s two in-game currencies. Crowns are earned through gameplay whereas Rubies are paid for with real money – it’s worth noting there are specific items that only Rubies will unlock. Alternatively, you can buy the Gigantic Starter Pack which permanently unlocks eight heroes with one skin and Rubies, or the Gigantic Ultimate Pack which permanently unlocks all current and future heroes with a host of extra goodies. 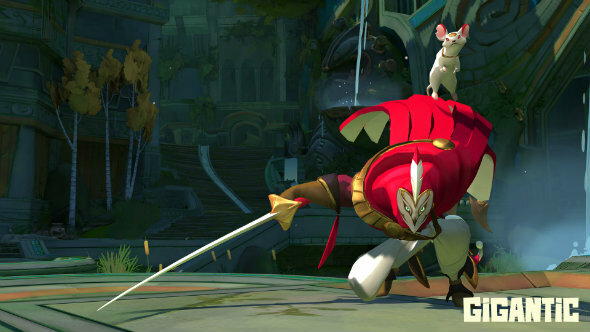 So, with your roster itching to do battle, how do you play Gigantic? The aim of the game is to capture points for your team and summon creatures to aid you in your 5v5 fight to control the battlefield. Doing this and getting kills powers up your Guardian – who will either be Leiran the cute griffin or Grenn the scary serpent – enabling them to rampage and pin down the opposing Guardian so your team can wound them. Wound the enemy Guardian three times to win. 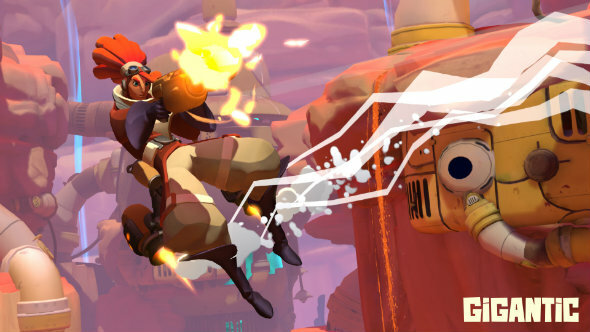 Even if you haven’t spent any money and are just getting started with Gigantic, every character is compelling to use in their own way. So here are the Gigantic heroes we think you should try out in each role: Front Line Initiator, Ranged Damage Dealer, Team Support, and Assassin. Not all heroes fit neatly into these categories, but a well-balanced team should feature a good mix of them. Primary: Frosty Swipes – Melee attack combo. Secondary: Snowball Toss – Throw a snowball that explodes upon hitting the ground. Inflicts stun and freeze. Q Ability: Slip and Slide – Slide along the ground. Press Q again to perform a melee hit that pushes enemies. E Ability: Frost Path – Create a path of ice in front of you that inflicts freeze. Grants speed boost to allies. Focus Skill: Breath of Frigid Air – Inflicts full freeze and turns enemies into snowmen. Breaking them out deals damage. Pakko is a great hero for charging the enemy at the frontline and prowling the locations of your summoned creatures. 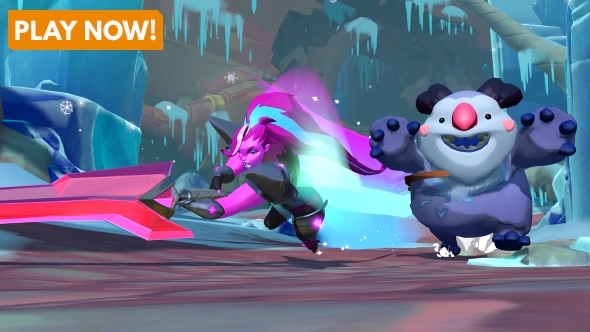 Pakko might look cuddly, but his cute exterior belies his fearsome power. When Pakko is bearing down on your front line you’re going to need skill to oppose his effective combination of high defense and speed. This doesn’t mean Pakko is the fastest hero, but his handy abilities allow him a significant movement boost to zip past the likes of Lord Knossos and The Margrave to the enemy’s front line. Frost Path doesn’t last long, but when it’s well-timed it can turn the tide of a rampage or creature stand-off. For an offensive rampage, you need to rush to the enemy Guardian and do as much damage as possible to score a wound point, so generating an icy path of speed-boosting goodness (and an enemy debuff) for your team is very useful. With your Snowball Toss or Breath of Frigid Air, this can drastically debuff the speed of your opponents while you rush past them towards the objective. Primary: Skewer – Melee attack combo. Secondary: Chuck – Throw your spear. Q Ability: Gore – Melee attack that interrupts attackers on impact. E Ability: Bull Rush – Increases movement speed. Focus Skill: Labyrinth – Deals armour-ignoring damage, stuns all nearby enemies, and inflicts bleeding and cracked armour. Lord Knossos has recently been nerfed making him quite a tricky character to play as now. But, with practice, he can be devastating if you strike the fine balance between knowing when to take a risk and when to hang back and restore your health. Thanks to his very high offensive ability, Knossos is a fearsome character who is perfect for beat-‘em-up fans and those that really want to get into the thick of the action. But, since your health hardly comes up to tank levels, you’re going to need to be wary of how long you can stay in the heat of battle. The best way to remedy this is to always keep support or ranged characters close to your side. When you’re in a position to charge or support a rampage make sure you use Bull Rush to rapidly increase your speed and aim for as many kills on your more fragile enemies. But bear in mind that your primary melee options are stamina-consuming, so get out before you’re overwhelmed and your death powers up the enemy Guardian. Primary: Bullet Barrage – A constant stream of bullets. Secondary: Rail Gun – Fire a powerful energy blast. Q Ability: Mortar – Lobbed, explosive projectile that knocks up and sets enemies on fire. E Ability: Fortify – Gain +20% front-facing damage reduction, increased accuracy, and resistance to pushes. You’re unable to move in this state. Focus Skill: S.W.A.R.M. – Fire a barrage of missiles. 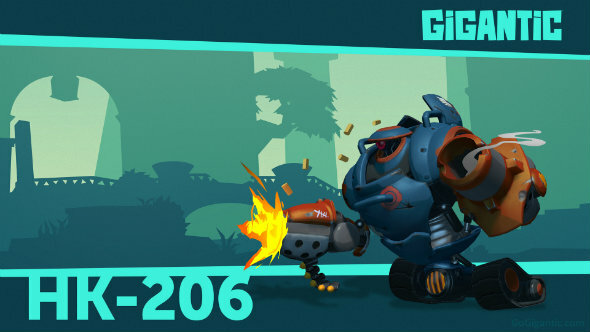 HK-206 is both an excellent defensive character and introduction to Gigantic. If you’re into shooters, HK-206 is a heavyweight hero that’s very simple to play: oftentimes, all you’ll need to do is place yourself in an effective position and rain down bullet hell on your opponents. You don’t need to press an extra button to switch between your machine gun and rocket, so simply pummelling your foes with a mix of Bullet Barrage and Rail Gun already gives you a great head start. Mortar and S.W.A.R.M. can also do serious damage, especially to groups. But Fortify is where HK-206 really comes into his own. It’s effective whether you’re defending a creature or your Guardian or laying down brutal suppressing fire as your team hares off in front of you. You won’t be able to move, but Fortify increases your front-facing defense by 20% as you concentrate your fire. You basically become a diamond-hard turret as you see a boost to your accuracy and push resistance. If you place yourself in a protected vantage point with other more mobile team-mates at your flank, HK-206 can be near-unstoppable. Primary: Machine Pistols – Shoot from your current weapon. Secondary: Grenade – Throw an explosive grenade. Q Ability: Cannon – Switch between machine pistols and your cannon. E Ability: Jetpack – Turns on Jetpack. Jump to boost upwards. Focus Skill: Air Strike – Target an area on the ground with a series of three missiles. Beckett is a little harder to use than HK-206 in terms of her weapons and damage – her rockets recently got nerfed – but, with practice, she can be an excellent and versatile ranged hero. What you trade for firepower you make up in movement, both on the ground and in the air. Your Jetpack is useful in many different situations from airborne shooting and controlling your team’s territory to making a quick escape. It also means you can quickly reach helpful vantage points, which is especially useful on the Sanctum Falls map. Getting the most out of Beckett is all about knowing which weapon is most effective in which situation, and on which map – you’re going to lean on your machine pistols much more in Siren’s Strand and your cannons in the tighter, smaller Sanctum Falls. Primary: Ray of Light – Beam that heals allies. Secondary: Smite – Beam that damages enemies. Can inflict burning with orbs. 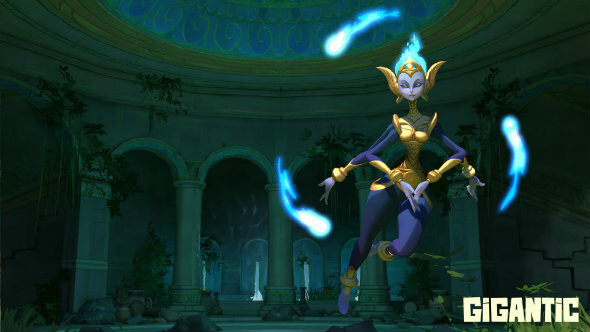 Q Ability: Divine Wind – Uses all orbs to increase health regeneration. E Ability: Devotion – Create spirit orbs. Each orb increases healing and damage by 100%. Orbs cost health to create. Focus Skill: Sanctum of Faith – Gain 90% damage resistance and +25% healing. Vadasi starts off a little weak because of her pure support role and a lack of self-defense. However, she’ll quickly become one of the best heroes on the battlefield if you spend your upgrade points in the right places. She becomes so useful, in fact, many Gigantic players predict she’ll be nerfed in the near future – use her in your current state while you can. The first thing we’d recommend for new Vadasi players is that you quickly upgrade the price with which you pay in health to create spirit orbs. Also, make sure you’re safely out of the line of fire when creating new orbs – you’ll only be handing your life to the enemy otherwise. Concentrate your healing in the right places and situations; you can only heal one member of your team at a time, so be sure to focus your regenerative powers on the allies with the lowest health. Also avoid wasting your powers on players in your team clearly running for a healing creature or if they’re in a safe place. Check yourself even when you think you’re safe, too: assassins like Tyto and Tripp love nothing better than to pick off unsuspecting healers behind the front line. Note: summoning more orbs will not increase the potency of your abilities, it will only increase the duration of them. So, if you have three orbs your buffs will last nine seconds on the last orb, but will still have the same effectiveness of one. A decent starter strategy is to summon two or three in a safe place, use self-heal, then use your final orb to bolster your support for the team. Then you can start to think about balancing your healing abilities with damage-dealing once you’ve got the hours under your belt. Primary: Fire Flask – Lobbed projectile: damages enemies with fire. Secondary: Acid Flask – Lobbed projectile: creates a pool of acid that inflicts cracked armour. Q Ability: Elastic Ooze – Lobbed projectile: creates a super jump puddle that pushes and deals damage to foes with a direct hit. E Ability: Healing Waters – Lobbed projectile: creates a healing area. Focus Skill: Chaos Quaff – Lobbed projectile: polymorphs enemies, locking out skills and slowing them. Play as Uncle Sven if you really like throwing things: every ability this handy healer has in his bulbous glass backpack involves chucking liquids of various consistencies, colours, and effects. Sven is more than just a healer, too, but unfortunately the decent damage he used to be capable of – hence his community nickname ‘Sven-assassin’ – led to him being nerfed. However, the variety of Sven’s abilities make him useful in many different circumstances: using Elastic Ooze is especially useful on the more vertical maps such as Sanctum Falls, for instance. And, despite his nerf, Sven can still handle himself in a fight when supporting a tank or bruiser. Although Sven has a range of skills and applications, you should stick to Vadasi if you’re looking for a straight healer. But, Sven strengths as a healer mustn’t be forgotten, either: Healing Waters has a potent area of effect health boost but you’ll get even more health from a direct hit. Choose Sven after mastering Vadasi and if you’re looking to diversify your support role. Primary: Lightning Strikes – Lightning-fast melee attacks. Secondary: Plasma Blades – Throw daggers. Inflicts bleeding. Q Ability: Electric Slide – Slide forward rapidly. Press Q again to perform a deadly kick that stuns and pushes foes up. E Ability: Flashdance – Gain stealth. Focus Skill: Bladestorm – Surge forward stunning and damaging the first target you collide with. If no enemy is hit, you return to your original location. Assassins are generally best suited to more experienced Gigantic players, but the gameplay rewards are rich if you’re willing to put the hours in. In terms of defense, Tripp is one of the squishier characters, so you’ll need to use your agility to run rings around slower characters or use your stealth abilities to get in and out in a flash. Flashdance allows you to be completely invisible for a short period, which can be just as handy infiltrating your enemy’s side of the map as it is when making an escape to heal. It’s by no means a good idea to take on multiple enemies head-on as Tripp: instead, you should use every trick up your sleeve to deal damage quickly with your Plasma Blades and Electric Slide and then get out of there, or team up with the brawnier characters like The Margrave to soak up pain for you. Primary: Talon – Melee attack combo. Secondary: Swoop – Powerful leaping attack. Q Ability: Blade Dance – Spinning attack that lets you move quickly. Cooldown increases the longer it’s performed. E Ability: Fang – Send out your pet to attack. Deals armour-ignoring damage and bleeds your target. Focus Skill: Blur – Rush forward in a blur, bleeding all enemies you pass through. Playing as Tyto The Swift is a similar experience to Tripp, but different in subtle and important ways. Like his assassin counterpart, taking on enemies head-on is a mistake – you’re going to need to be tricksy in your approach if you don’t want to see your health dwindling rapidly. Unsurprisingly, Tyto’s strength lies in his superior agility and movement speed, so use this to your advantage. Rather than tackling enemies face-to-face, attack from the sides and behind your foes. 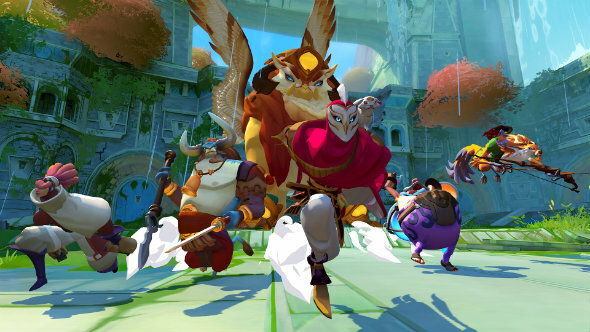 Tyto is best played when you keep an eye out for struggling enemies looking to make their escape after taking damage from heroes like Lord Knossos or Pakko. Use your pace to pick off these low-health enemies as they make their retreat. Blur and Blade Dance are especially useful for this strategy, but also for when you’re nibbling at the health of tanks and other slower enemies. There’s nothing more frustrating in Gigantic than when playing as HK-206, Imani, or The Margrave, you’re scrabbling to get Tyto in your crosshairs as he dances and spins around you dealing damage and then making a ‘swift’ escape. And those are our suggestions for characters to play as in Gigantic. Let us know what characters best fit your playstyle in the comments below.